Tern Blog - Healthy Water at the "Point of Use"
At Tern, we frequently talk about empowering people to get healthy water at “the point of use.” What do we mean by that? When you fill up your water bottle before you go for a run or to the gym, chances are you use your kitchen faucet - that’s what we mean by “point of use” - its the place where you fill up your glass of water or water bottle or pitcher. For most of us, when we are at home, that starts with our kitchen faucet. 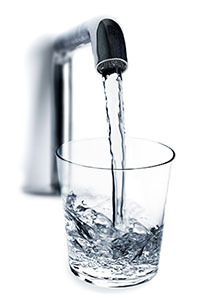 The water issues that many cities and communities face in terms of water pollution and how that is affecting our ability to get a healthy drink of water, start long before we turn on our kitchen faucet. For the most part, water pollution begins in our infrastructure which is managed by cities and municipalities. That means, that, for the average person, it may be challenging for us to be able to quickly and effectively improve the system. So at Tern, we are trying to simplify the challenge and give individuals an opportunity to take action to improve their own water by educating themselves on their home water quality using our Know Your Water test kit, which uncovers any risks in the water coming out of your kitchen sink. And later this year, we will be offering the Smart Faucet, a new way to filter your water at the point of use, your kitchen faucet, that also lets you sync with your smartphone to understand water usage, environmental impact and filter status, all in real time. Water issues can be complex. At Tern, we are working to make them simple and easy for anyone to improve every time they go to get a drink of water.